Hey people! Thanks for stopping by! 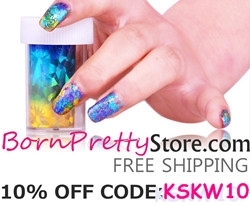 Today I’m going to review other pretty nail art decorations from Born Pretty Store. Let’s proceed! Product description: Beautiful flower pattern rhinestones which give 3D look to your nails, add shine and beautify them. It is easy to apply and can be applied on both natural and artificial nails. 3D Crystal Flower Rhinestone Nail Art Decoration comes in a plastic bag where in you get 5 pieces. These are travel and budget friendly. You can easily buy them from BPS and also don’t forget to enter this 10% coupon code at the checkout: KSKW10. This decoration is easy to use and can be used by both professionals and beginners. It gives you a neat nail art design with a lot of colors. Other than this pattern, you get 3 more variations to try, so don’t forget to check out them as well. I always love patterns which gives 3D look to my nails so I thought why not to give it a try. And I must say. I’m really happy trying out this decoration. Plus point is you can reuse them twice and thrice. Other than nail arts, you can use them to decorate your home, cell phone’s case, glasses, made card, body art, etc. I’d recommend you to grab this nail art decoration and flaunt the beauty of your nails. Don’t forget to enter this 10% coupon code: KSKW10; this won’t expire so you can use it millions of times. 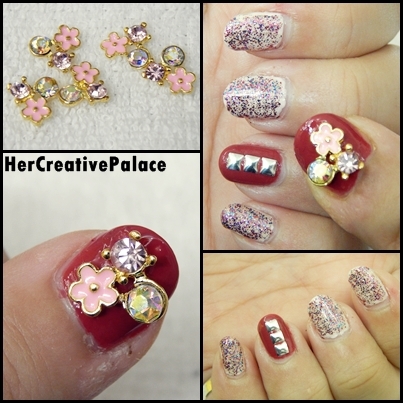 NOTD: This is the nail art design I created using 3D Crystal Flower Rhinestone Nail Art Decoration. 3D Crystal Flower Rhinestone Nail Art Decoration are pretty flowers rhinestones which beautify your nails and adds beautiful shine. These are easily available and can be reused. I’ll recommend you to grab this product and create amazing nail art designs. Have you tried 3D Crystal Flower Rhinestone Nail Art Decoration? Do share your views and experiences in the comments below. Disclaimer: PR sample sent by the brand for review purposes. All the opinions and experiences shared are my own.